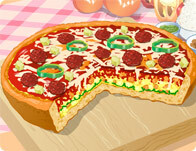 This game is great for kids beginning to use the computer or any pizza lover. 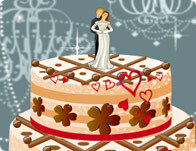 In Delicious Emily's Wonder Wedding, a tasty cooking game, you help Emily prepare for her big day! 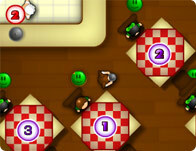 Manage restaurants, cook delicious meals and serve the guests. 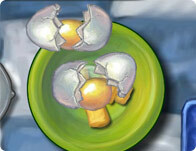 Eggs are a blast of protein that help you start the day off with energy, ambition and nutrition. Get fancy and have fun with this new twist on an old favorite! Use this factory to make the ice cream in a fun, fast way that all of the customers will enjoy. You've invented this amazing machine, and now you can play with it all day! 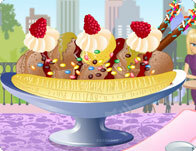 Create your own Ice Cream parlor! Move around items in your store so it looks perfect for all your customers! This game tells you how to cook a turkey starting from choosing it at the store to serving it on the table with the right utensils . . . to a point. 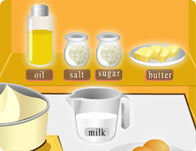 Cook some delicious pancakes up with this fun cooking game! 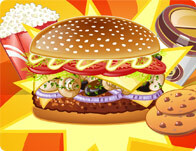 Grill up some deliciously good times at your hamburger stand and serve it up with a smile in this fast, fun and challenging restaurant simulation game! 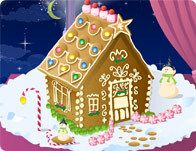 Create your very own chocolate house. It tastes even more than delicious than it looks, but don't be the first one to rip the roof off! Create the most amazing over the top ice cream flavor ever made! Load it up with all your favorite toppings and chocolate syrups, and then go eat the real thing! An American favorite. Foot long, piping hot and dressed to impress with all your favorite sides and sauces. The Hot Diggity Dog is a delicious meal or treat any time of the year! 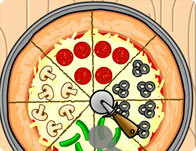 Bake up some world class fun in this cute and easy international cooking game from Holland! Help Mama cook her delicious Mexican fajitas! 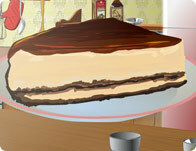 Whip up a delicious, creamy , chocolaty dessert in this fun and fast paced cooking game! Yummy traditional turkey dinners are fun any time of the year! Gather the whole family and chow down on some home made turkey with gravy, vegetable sides, and cute garnishes. You're in charge of a factory baking all kinds of delicious cakes! Summer means BBQ! Serve up some delicious hot off the grill creations like fish, chicken, ribs, and kabobs as you collect cash and campaign your way through new levels and upgrades. Help this cute gal toss up a delicious summer salad for her boyfriend! Its a romantic and healthy meal complete with eggs, tomatoes, cheese, spinach and more! If you ever wondered what your wedding cake could look like, this is your chance. How sweet and tasty do you want this delicious wedding cake to taste? I have no idea was entrecote is. Isn't it French for inside a coat? Well, it looks like a big chuck of meat, slathered in barbecue sauce. And how could that be bad? Rush for ice cream! Racing is even more fun when you are racing for tasty treats! Follow the recipe to make delicious Turkey Burger. Its dinner time! Help out in the kitchen to cook some spicy steak fajitas for your lovely girlfriend! Make sure to follow the recipe correctly so she isn't disappointed. Toto just graduated from bartending school and how he wants to show off his cocktail creations! Invite all of your Lisa, Mina, and Sisi to have them try out all of your delicious drinks! Flip the pan cakes, catch them for point and don't flip them too high or they'll get stuck on the roof! Tis' the holiday season! It's time to make the turkey, this game tells you exactly how to make a turkey. 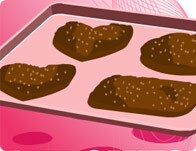 Run your own cookies bakery, take orders and make them quickly before your customers walk out! 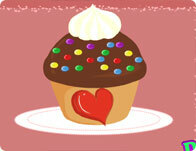 A fun game for all you chocolate lovers! 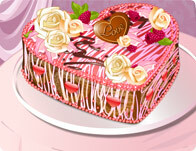 Make tasty chocolate and share with your friends. Prepare as many sandwiches as you can within the time limit. This is a fast, fun paced restaurant where customers know what they want and they want it now! Run around taking their orders and serving it up with a smile! Go ice cream crazy with chocolate frosting, coffee bean sprinkles, and a platter of candied fruits all around your favorite frozen dessert! 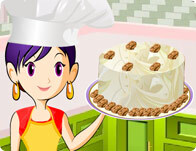 Make yummy cakes with this cute squirrel in a fun math and attention based cooking game. How many correct dishes can you make before time runs out? Bread Pudding is a traditional English dessert made with chopped up bread cubes, crunchy brown sugar-coated nuts, and syrupy butter to top off the baked bread with a sweetened bunch of crunch! Tasty or terrible, you are the master of your muffin creation! Learn how to prepare a Fried Ice Cream based on a real recipe! Fill up your plate with a heaping helping of all your favorite thanksgiving dishes! Mashed potatoes, Turkey, Ham, cranberry sauce, gravy, and all the veggies you can fit. Yum, yum! 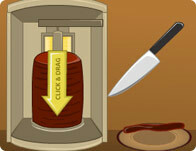 Serve customers as quickly as possible over 5 levels of this flash cooking game. Jessica loves to bake cakes all day long! 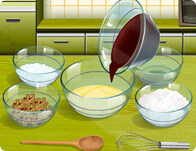 Help her become an amazing baker with this fun baking game. Cake Master contains almost 50 stages, each with its own unique challenge. Delicious and nutritious! Dive in to a custom made bowl of yummy salad complete with organic everything, succulent sauces and fresh, colorful garnish! Seafood never tasted so good! Fry up some shrimp and add them to plate of lettuce, onions, peppers and your very own specialty sauce for a delicious nutritious twist on salad. Froyo is the perfect dessert to finish off a heavy meal. It's a light ice cream, and it's usually paired with a nice fresh piece of fruit to give it that amazing sweet and tangy taste! How many different flavors and scoops can you fit on one cone? Find out and create your own super Ice Cream cone! A little known secret about monkeys is that they absolutely love ice cream! 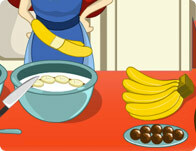 Help this cute little guy make his own favorite banana infused concoction of iced cream. 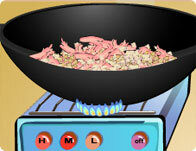 Fry, prepare and serve up yummy home made, grill fired shrimp sandwiches to your friends and customers in this fun, fast and tasty new service game. Bake up some delicious snow man cookies! Keep them colorful and have a lot of fun. Bring some merriment to the twin babies in your house and give Santa something to crunch on! Have a tea party by yourself or with a friend! Pick your own customized antique or modern kettle, matching, or clashing tea cups and a delicious lite snack on the side! Sara's ice cream stall has been opened in the beautiful beach in Hawaii. So many people like to be here and Sara is so busy that she needs your help getting her customer order ready. Top up three layers of flavored jello with ice cream, fruits, chocolate, and candies as you prepare yourself a mouth-watering delicious and delightful cocktail. What is your favorite breakfast, lunch, or diner food? What is your favorite snack? Think about it for a moment and then add bacon, maybe a little chocolate sauce. You're welcome. Take customer orders and serve up some tasty pancakes for summer cash! With thousands of options at your fingertips, you can create the most delicious and unique birthday cakes, ice cream sundaes, and cupcakes! Personalize and customize them for every occasion! 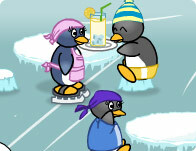 Try to be a waitress in the restaurant. If you manage to keep the customers happy you will gain some big tips. Matthew is a master at cooking and he has to prepare for a great dinner help him to cook as many dishes as you can! Make fun smoothies for customers as fast as possible! You will have a blast at this summer job! Cover this gooey golden cake with tons of colorful fruits and candies then sprinkle on a chocolate garnish for a delicious treat! Have a happy birthday filled with fun, friends, and delicious treats! Serve your best buds cake, jello, ice cream and all sorts of candied treats to keep everyone happy! A black hole opens and screaming out come some of the tastiest tiniest burgers you've ever seen. Yummy delicious cheese and all the toppings you can think are invading your taste buds! In the coming hot summer,do you want to make delicious ice cream for yourself? Well, Annie will teach you to do it.Learn it carefully and you will find you are also a well-skill cooker. Mix and match your favorite flavors to make the ultimate mouth watering super Ice Cream creation! Create the most amazing fruit platter for you and all your friends. Pick tasty fruits and decorate the platter like a real pro! Feed all the hungry customers at Cuti's Diner. You'll have to hurry to keep up! She might be the youngest fruit delight shop owner, but her fruit desserts are by far the most delicious ones. How about giving her a helping hand in serving all those customers entering her shop?